After having been cancelled in the two previous years, this year exercise Frisian Flag took place once again at Leeuwarden AB, home of the RNLAF 322 and 323 Squadrons. From 26 September until 7 October 2005 two missions where flown daily from Leeuwarden. 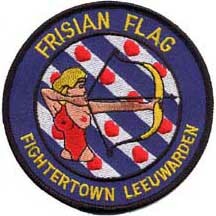 The Frisian Flag exercise can be compared with the Maple Flag exercise in Canada, and the Red Flag exercise in the USA. Although these are much bigger. Goal of this exercise is to make the participating countries familiar with complex missions in different ground/air roles while working together, and with international participants. The majority of the missions is flown over the North Sea, over an area extending to Denmark. Besides these missions also the bombing and firing range at Vliehors, military exercise territory Marnewaard and the area around Zurich (NL) are used for practising. The missions were flown from 09.00hr until 12.00hr and after a break again from 13.00hr until 15.30hr. Minimum flight level was about 150 meters (500 feet). No missions were flown during the weekends and nights. This year almost 40 aircraft from five different countries participated. From the Dutch air force all F-16 squadrons participated with the exception of 306 Sqn. Sweden took part with six JAS 39A Gripens from F17, Finland with six F-18C Hornets, United Kingdom with six Jaguar GR.3As of RAF 6 Sqn and Germany with four F-4F Phantom IIs (JG 71). For many enthusiasts, the highlights included the departing of the Phantoms and the Jaguars. After take-off most of them stayed very low, so they could be photographed very nicely. Quite on the contrary, the Gripens showed off their specific speciality of short take-off too much for the enthusiast’s liking. They had reached a flight level of 1500 meters (5000 feet) very quickly after take-off. Turning them into small dots on the viewfinders of the photographers positioned at the end of the runway. Overall the Frisian Flag exercise is a ‘must see’ for every military aviation enthusiast. Providing great photographic opportunities all around the base, and with some good weather, Frisian Flag makes superb shots possible. Shots that you cannot imagine making at a show like Fairford. The Jaguars and Phantoms made this exercise very special, due to the fact these two types have entered the finals years of ‘the last of the dinosaurs’. This year’s Frisian Flag exercise was a very successful one for the military aviation enthusiast.